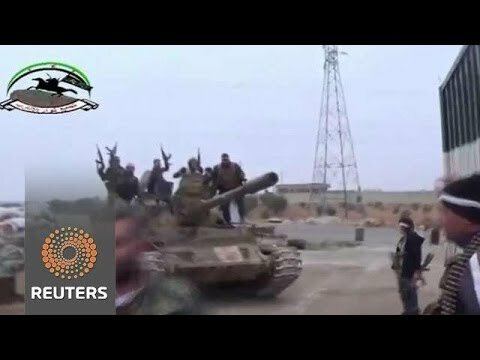 It was bound to happen, this uprising within an uprising against the Islamic State of Iraq and al-Sham (ISIS), a transnational ultraconservative Islamist group that ostensibly fights alongside Syria’s disparate rebel groups but more often intimidates, antagonises, or opposes most of them, including other conservative Islamists. Long brewing tensions between ISIS and many other rebel groups exploded on 3 January in fierce clashes that have quickly spread across northern and northeastern Syria. It’s a localised, extremely fluid fight, with some groups like Jabhat al-Nusra (JAN) opposing ISIS in some areas while trying to mediate between it and other rebels in different locations. The fight has rallied an unlikely motley group of rebel brigades against ISIS while also testing the cohesiveness of some groups. ISIS has been a thorn in the Syrian revolution since the group’s inception in April 2013, when its leader, the Iraqi Abu Bakr al-Baghdadi, announced the merger of his Islamic State of Iraq (ISI) with a group it spawned, Jabhat al-Nusra, headed by the Syrian Abu Mohammed al-Golani. Golani rejected the union and instead affirmed his allegiance to al-Qaeda leader Ayman al-Zawahiri. Zawahiri, in turn, ruled against the merger and ordered each group to stay in its separate arenas: the ISI in Iraq and al-Nusra in Syria – a ruling that Baghdadi ignored. Many of the foreign fighters, or muhajiroun, fighting with JAN sided with Baghdadi in the dispute and joined ISIS, leaving Nusra more Syrian almost by default. In the months since, ISIS filled its jails with anyone who opposed or questioned it or was perceived as engaging in anti-Islamic activities. It detained activists, civilians, rebel commanders who identified themselves as Free Syrian Army (FSA), as well as others who belonged to Salafi Islamist groups, like Ahrar al-Sham and even JAN.
ISIS is known in Arabic as il-Dawla, the state, which is exactly what it hopes to replace, although its detractors refer to it as Daesh, its Arabic acronym and a term that the group considers derogatory and therefore punishable with 70 lashes. Il-Dawla started to set up its state in territory that it controlled, either by pushing other rebel groups out of towns and cities or intimidating them into submission. It ignored the Qur’anic verse that “there is no compulsion in religion” and imposed its austere interpretation of Islam on the local Syrian populations in areas in which it was based, most notably in Raqqa city, the only one of Syria’s 14 provincial capitals to fall from the regime’s grip. A Jabhat al-Nusra contact I met in the city back in March told me that ISIS men would board buses heading into Raqqa and prevent the bus from entering the city if he saw any woman wearing make up or trousers. ISIS even detained and reportedly executed JAN’s emir, or leader, in Raqqa, Abu Saad al-Hadrame, in the midst of these recent clashes. ISIS did, however, do some things in rebel-held Syria that even its detractors acknowledge were needed, like clearing out criminal gangs that had been exploiting the lawlessness, as well as some rebel brigades. An FSA commander in the east lamented that some of these now-routed rebel groups were so destructive to the revolution’s ideals that “some people started wishing for and lamenting the loss of Bashar’s [al-Assad] regime because of people like that”. Over the past few months there has been a steady rumble of low-level but significant skirmishes between ISIS and other groups, most notably with Ahrar al-Sham in the Aleppan town of Maskana in December. ISIS has been picking fights, big and small. The last straw appears to be its detention, torture, and killing of Abu Rayyan, an Ahrar al-Sham commander and doctor. Pictures of his bloody, swollen, and disfigured corpse sparked anger and outrage across the political spectrum in the rebel-held north. And so it was little surprise when clashes exploded on a larger scale earlier this month. The armed Syrian opposition, in all of its disparate glory, has long talked of a revolution after its revolution to unseat Syrian President Bashar al-Assad, a period when scores would be settled between various anti-Assad groups. The fault lines depended on whom you talked to. Some insisted that they would be ideological, between less Islamist groups and ultraconservative Islamists like JAN or ISIS; others said that they would take on particular rebel commanders turned warlords or that the fight might be territorial or ethnic between the Kurds and Arabs. The list went on. Elements of all of these various fault lines had become frontlines during isolated bouts of rebel infighting over the past year or more, but the decision by so many different groups to take on ISIS at the same time, and in so many locations, was surprising. What was also surprising was how quickly ISIS was initially routed from some areas. “They were just cardboard cutouts”, one FSA commander in Idlib province said of the much-feared group. Perhaps, but this is just the beginning. It’s already clear that ISIS’ revenge will be vintage ISI – car bombs, assassinations, and possibly large-scale violence that is not restricted to combatants. Everybody I’ve talked to says the housecleaning, while necessary, also means that the situation in rebel-held Syria has now entered a much murkier, infinitely more dangerous phase, one in which it will be harder to differentiate friend from foe, especially given the localised nature of the fight. Foreign fighters in particular have borne the brunt of the anger directed at ISIS. There is anecdotal evidence that many are crossing back into Turkey with their families to flee the infighting. Many rebels interviewed in Turkey expressed hope that ISIS might be driven back to Iraq to wage Jihad against Nouri al-Maliki’s government given recent events in Fallajuh and elsewhere. ISIS, however, remains defiant and determined to continue its transnational jihad. ISIS spokesperson Abu Mohammed al-Adnani recently issued an audio statement in which he lambasted rebel attacks on “those who left their homes [and] families to defend you and die so you wouldn’t have to die. Is this your reward for them?” He said that his opponents stabbed his group in the back “and attacked our bases when they were mainly empty”, adding ominously that ISIS had armies in Iraq and Syria “that drink blood and eat bones and find nothing tastier than the blood of sahawat”, invoking the “s” word to describe his group’s foes. Sahawat, or awakening, is a dirty word in much of rebel-held Syria due to its connotation of collaboration with the United States. It refers to the Iraqi tribal leaders who took on the ISI in their communities but who worked with the US military to do so. So who has lined up against ISIS? Two coalitions in particular: the newly formed Mujahideen Army, which literally emerged at the start of the clashes, and the Syrian Revolutionary Front (SRF, formed in early December), comprised of the remnants of once-formidable FSA groups like Jamal Maarouf’s Syrian Martyrs’ Brigade and the Northern Farouq Brigades. Maarouf, the most public face of the SRF, has declared war against ISIS, a move that has rehabilitated his image in the eyes of those who also describe themselves as FSA. By the end of 2013, he was looking like a spent force. Many of his colleagues had long taken to calling him Jamal Makhlouf, pinning him with the surname of Assad’s cousins who hold business monopolies in the country thanks to nepotistic corruption. Commanders frequently complained that Maarouf was more of a showman and warlord than a fighter, promising to participate in a particular battle, securing the funding for it from sponsors (mainly Saudi Arabia), and then withdrawing soon after the fight began, in addition to filming enough footage to upload to YouTube to boast of his group’s participation. It was a common complaint. Now, many of those same men speak with admiration of how Maarouf is personally fighting and how his men are pushing back ISIS with vigour. The IF, for its part, is a formidable coalition of Islamist groups outside of the FSA umbrella (and openly derisive of it) that was formed in November. The seven member groups – Ahrar al-Sham, the Army of Islam, Suqoor al-Sham, Liwa al-Tawhid, Liwa al-Haq, Ansar al-Sham, and the Kurdish Islamic Front – are the main power on the ground, outside of ISIS and JAN. While many in Western capitals continue to trumpet the near-defunct FSA’s Supreme Military Command Council, led by General Salim Idris, as a partner that they can work with, Idris has little more than the West’s ear; the IF has the fighting men on the ground who listen to its leaders. Some think that the clashes with ISIS were purposely engineered to happen just before the much-publicised but likely irrelevant Geneva II peace talks set to begin on 22 January to push back against Assad’s narrative that a Syria without him would be ruled by Islamist extremists and to show international community that there were armed rebels that it could work with. It serves the interests of the members of the Syrian opposition heading to Geneva and some of the more secular armed groups who recognise the coalition but not the likes of the IF, according to a highly-placed source close to the IF’s leadership. The IF, in addition to JAN, is likely to benefit the most from ISIS’ likely temporary loss of territories (ISIS has already regained some areas that it was initially forced back from), because they are far stronger and more disciplined than other armed rebels. ISIS’ overreach and brutal methods have also made the al-Qaeda-linked Nusra seem quite moderate by comparison. Before ISIS emerged, much of the talk in rebel circles about an uprising after the uprising fingered Nusra as a target. Instead, Nusra has soaked up foreign fighters fleeing ISIS and has projected itself as peacemaker. Nusra leader Golani, in an audio recording released the same day as the ISIS’ Adnani, said that the ISIS’ “wrong policies” had ignited this conflict, and he offered to mediate an end to the fighting, even as some Nusra groups were fighting against ISIS. He, like Ahrar al-Sham’s leader, warned against targeting foreign fighters, and both men have offered their bases as sanctuaries for fleeing muhajiroun. Still, the IF’s various components haven’t exactly responded with one voice regarding the ongoing clashes with ISIS. It is no surprise that the Army of Islam has been the most outspoken group within the Front to criticise ISIS. The group’s leader, Zahran Alloush, has described ISIS as “tyrannical” and “deviant”. The Army of Islam is Salafi-light compared to the other components, which initially took a more nuanced approach, criticising ISIS for its heavy-handed arrogance and for considering itself a state rather than an armed faction just like the rest, but they stopped short of declaring all-out war against it. In some cases, discipline within units started to fray over the issue. Some units within Liwa al-Tawheed, for example, attacked ISIS, while others disavowed themselves from those battalions. The highly-placed source close to the IF’s leadership said that ISIS was neither an enemy nor a friend to the group and that the units of the front fighting against ISIS were engaged in self-defence. “We have strong objections against [ISIS]”, he said. “We would wish that they weren’t present in Syria but we are not prepared to open a war and spill the blood of mujahideen [holy warriors], ours and theirs, in the interests of the West or others”. The localised nature of the fight, with some components of the IF fighting ISIS in some places and not in others, was a reflection of how ISIS was behaving in a particular area, the source said. “Il-Dawla didn’t harm us in Homs, so Liwa al-Haq hasn’t participated. It hasn’t harmed us in Damascus, so the Army of Islam, even though Zahran Alloush is speaking harshly of the Dawla, isn’t fighting it in Damascus till now”. It’s unclear how much exactly unites the seven groups that form the IF and if the unity will hold. Ideologically they are all Sunni Islamists, but the Salafis among them follow different strains of Salafism, and some groups aren’t Salafi. Their individual sources of funding are also not the same. Although it is widely reported in the media as Saudi-backed, it’s not clear that it is. The Army of Islam is backed by Saudi Arabia, which in general has opposed most Islamist jihadi armed groups, including some that are part of the IF (the Army of Islam follows a strain of Salafi Islam that gels with Saudi Arabia and that stresses obedience to Muslim leaders, while other groups like Ahrar al-Sham do not). These latter groups were more traditionally backed by Qatar, Kuwaiti donors with links to the state, as well as private sponsors from other Gulf countries. The senior IF source acknowledged the disputes and differences within the IF but said that they were political more than ideological. “What I mean is some want to create the [Islamic] state through weapons, others through politics. It’s about political questions”, he said. At the moment, the IF looks like a political alliance aimed at getting things from the Supreme Military Command Council that it openly despises, and its political parent, the National Coalition, that the IF doesn’t recognise as a legitimate representative of the Syrian opposition. It wants the council restructured “so that it has a completely different political orientation than the coalition”, according to a member of Ahrar al-Sham’s political office. “Either the international community helps us the way we want, or we don’t want anything from it”, he said. That’s a difficult demand for the West to accept, but with Geneva II talks looming and in the unlikely event that some sort of agreement is reached in the negotiations, it will mean little without the IF’s buy in. Some Western diplomats understand this and are reaching out to the IF. Senior representatives from Suqoor al-Sham, Ahrar al-Sham, and the Army of Islam met with the pro-opposition Friends of Syria grouping in Ankara, Turkey late last year according to diplomats and rebels who attended the meeting, but the IF later very publicly spurned what would have been a second round of talks with US Syria envoy Robert Ford in mid-December. American diplomats are still keen to speak with them, because, as one said, “the Islamic Front has been the most successful political move on the opposition side, as sad as that may be”. The IF source said “in terms of meeting with Americans or the West or the East, there are many of us in the Front in leadership positions who don’t have a problem sitting with anybody except the regime, the enemy that is killing us”. The problem, he said, was that they don’t trust the Americans and don’t want to be viewed as Western collaborators, regularly meeting with Western officials. “They’re liars”, he said. “They’ve been lying to us since the beginning of the revolution and they continue to lie. We didn’t get real support from them, all of the promises were lies, and the little American support that came didn’t come to us”. Ahrar al-Sham said that it is drawing the components of the IF toward its worldview; others think that the Army of Islam (with a strong Saudi push) is trying to do the same. Meanwhile, several members of the IF have said that the seven groups hoped to eventually completely merge and do away with their individual identities. It is a long-term strategy, and an ambitious one at that, given differences between the leaders of each group and their outlooks and their various sources of funding. The senior IF source said that there was talk of creating a “common pot” that would funnel all funding and weapons – from external and internal sources, including armaments obtained as war booty – that would then be divvied up. JAN, meanwhile, is trying to walk a fine line between ISIS and the other armed groups. The senior JAN fighter acknowledged that the IF was the biggest power on the ground, but said that it lacked ideological cohesion and strength. It’s “ink on paper, united only by its fear of Daesh”, he said, using the derogatory acronym for ISIS. “The number one war in Syria is ideological”, he said, “and Daesh is strongest ideologically. I’m not talking about if their ideology is right or wrong, but they’re convinced of it”. Some ISIS men even called their counterparts in Nusra unprincipled, he added. “Killing Daesh isn’t easy. I don’t say that out of fear, but there is no fatwa to do so”. He declined to say who might issue that fatwa but recalled an episode that he witnessed a few weeks earlier to highlight how fiercely ISIS would fight for what it wants. The senior JAN fighter said that he was present at a meeting between a Nusra emir and an ISIS emir in the eastern city of Deir Ezzor. The three Syrian men had all known each other for years and were friends. The fighter said that the ISIS emir told the Nusra emir: “If it comes to it, I will kill you, and then I will cry for you”. This round of infighting in rebel-held Syria has only just begun. Rania Abouzeid is a visiting fellow with the European Council on Foreign Relation’s MENA Programme.